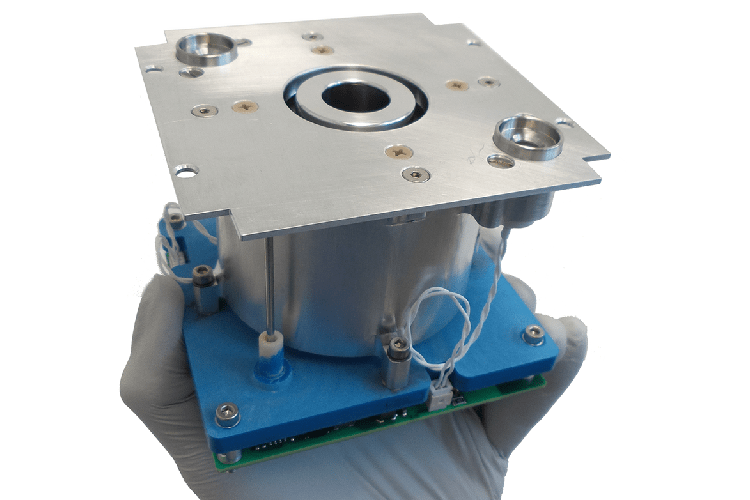 The IFM Nano thruster was developed as spin-off from a thruster being developed for high precision control of ESA’s Next Generation of satellite Gravity Missions. Building on more than 30 years of experience with ion sources for space applications, FOTEC is the only group world-wide to deliver space-qualified liquid metal ion sources to a large number of missions such as Rosetta or MMS. The operating principle (Field Emission Electric Propulsion – FEEP) is based on field ionization from the tips of a porous tungsten crown at positive potential and consequent electrostatic acceleration of the Indium ions. One of the advantages of this technology is that the thruster can provide highly accurate thrust ranging from 10 – 500 μN, operating at a significantly higher Isp than other electric propulsion technologies. Due to the use of a solid propellant and the absence of a propellant management system, it is possible to build a complete subsystem with a much smaller size and weight than other technologies providing the same total impulse. 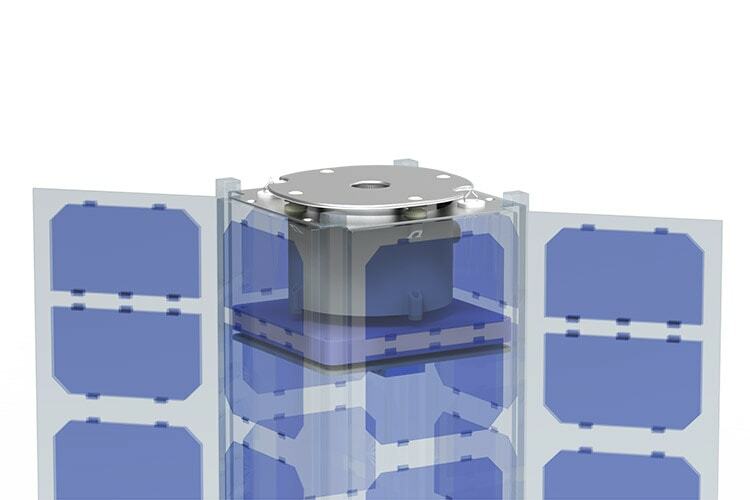 The whole system can be accommodated in a volume of 10x10x6 cm or 0.6U Cubesat including all power electronics, which allows Nano satellites to perform orbit changes and station keeping and thus increasing significantly the mission range. It also allows large satellites to control their position with an unprecedented accuracy enabling e.g. formation flight of scientific satellites. The IFM Nano Thruster is a mature technology, developed under ESA contracts for 15 years. In this time more than 100 emitter have been tested and an ongoing lifetime test has demonstrated more than 13.000 h of firing without degradation of the emitter performance. 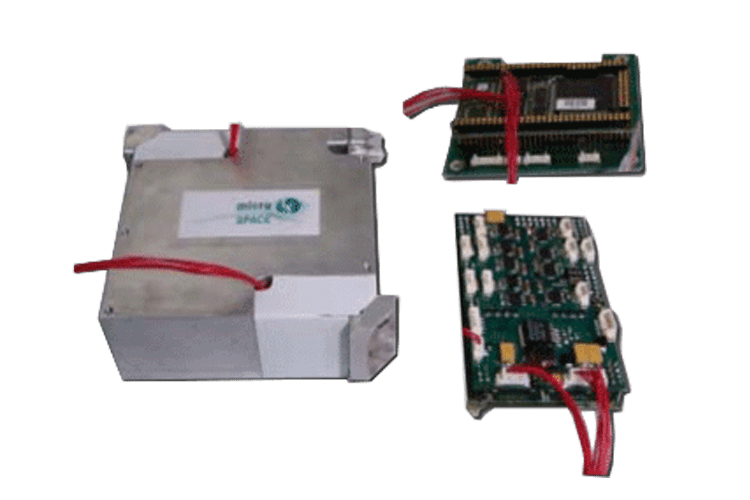 Due to the efficient ionization process which allows to ionize up to 60% of the evaporated Indium atoms, the IFM Nano can provide a higher specific impulse than any other ion propulsion system currently on the market. As the IFM Nano thruster expels an ion current of up to 3 mA, the module needs means to prevent spacecraft charging. This is achieved by the use of two cold-redundant electron sources acting as neutralizers. Such an electron source consists of a Tantalum disc which is heated up to 2,200 K and biased to -200 V. Once electrons have left the neutralizer, they will be pulled towards the positive potential of the ion plume. The PPU is able to measure and control this charge balancing electron current. The IFM Nano contains no moving parts and the propellant is in its solid state at room temperature. Avoiding any liquid and reactive propellants as well as pressurized tanks significantly simplifies handling, integration and launch procedures. 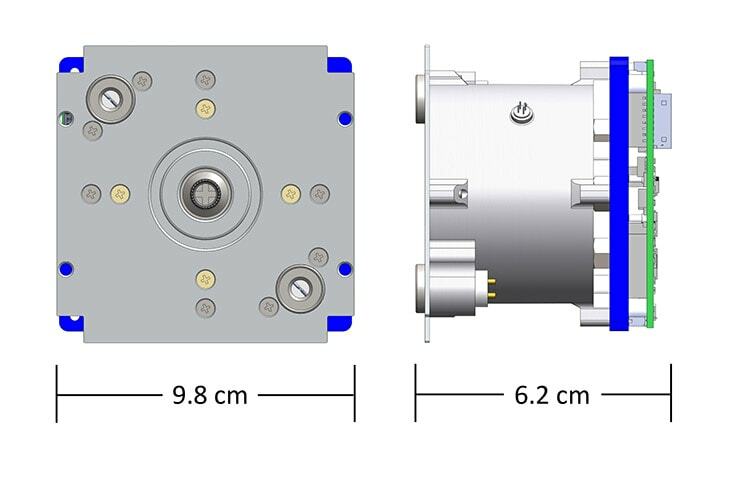 The IFM Nano thruster module is used as a compact pre-qualified building block in order to provide custom solutions at a commodity price and ultra-short lead times. 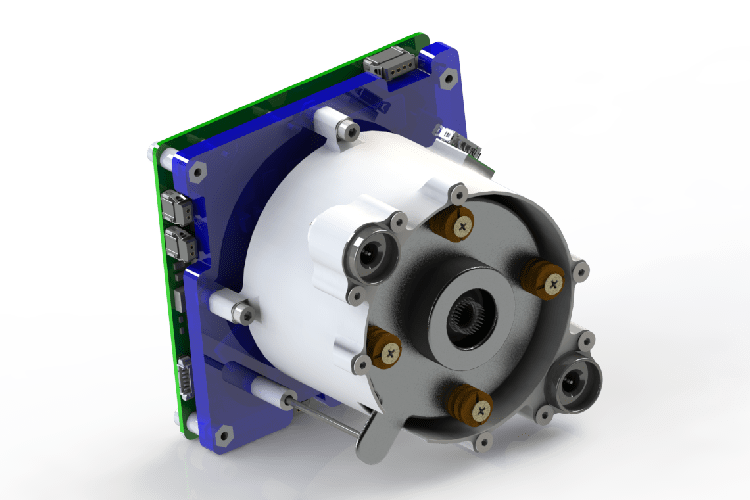 Although building block is a complete self-contained propulsion system, the whole cluster can be operated as a single plug and play unit. 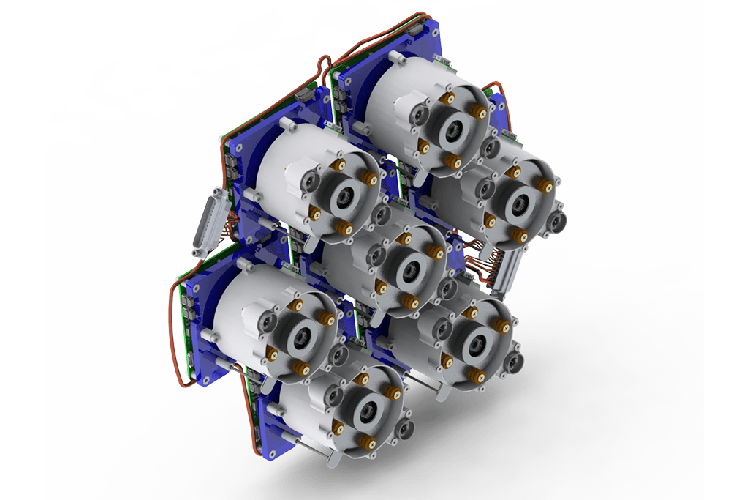 Using a cluster of IFM Nano Thruster modules for small satellites provides a significant thrust vectoring capability. While the required power to operate the IFM starts at around 8 W, at higher thrust levels one can choose between high thrust and high specific impulse operation. The IFM 350 can operate at an Isp range of 2000 to 5000 s. At any given thrust point, higher Isp operation will increase the total impulse while it will also increase the power demand. The thruster can be operated along the full dynamic range throughout the mission. That means, that high Isp and low Isp maneuvers can be included in a mission planning, as well as high thrust orbit maneuver and low thrust precision control maneuvers.